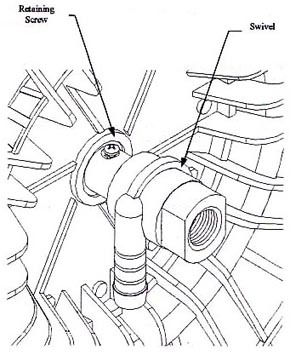 RELEASE LINE PRESSURE, DISCONNECT FLUID SUPPLY AND RELEASE SPRING TENSION BEFORE ATTEMPTING ANY MAINTENANCE OF THE REEL. 2. Remove screws from locking plate. 3. Remove any three screws from tension plate. 4. Hold tension with hand while unscrewing the last screw. 5. Let both plates spin in hand (2-3 turns) to release tension. 1. Fully retract the hose. 3. The arrow on the tension plate must be vertical for proper engagement. 4. While holding the tension plate in place, replace screws into the tension plate. 5. Align the locking plate onto the assembly using the swivel as a guide and replace the screws. 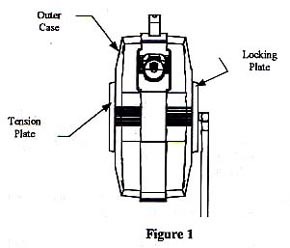 IMPORTANT: Side plates are connected via a brass and nylon shaft. Do not attempt to turn one side without the other side turning simultaneously. Turning one side only will result in a broken nylon shaft or other possible damages. 1. Release spring tension by following the instructions in "Releasing Spring Tension". 6. Cut the hose clamp off swivel using a suitable tool (Eg: Side Cutters). 10. Replace old Sub 100 Assembly with new one. 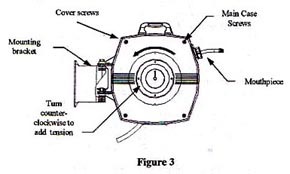 Refer to "Replacement of Hose" steps 9-19 to reassemble reel.